DNA Analyst, MacKenzie Kilkeary, talks to teens about his job. 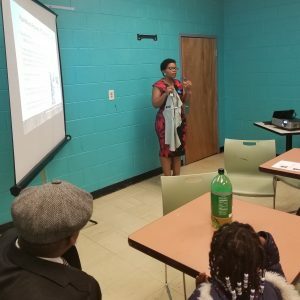 In our latest meeting at Atlanta Teen Science Café forensic science was the area of focus. A group of forensic scientists from the Georgia Bureau of Investigations (GBI) in the Forensic Biology Division served as speakers for the event. The group comprised of Jasmine Anderson, a forensic technician, and Toniesha Glover and Mackenzie Kilkeary, both of whom are DNA Analysts. The speakers started the café talking about their individual pathways to becoming forensic scientists and what their roles and responsibilities are at the GBI. 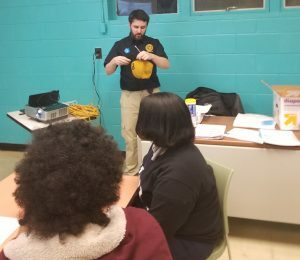 After a brief presentation and introduction to forensic science, forensic biology and DNA analysis, the presenters further explained the exciting stuff in forensics like gathering and testing evidence at a crime. Later, the teens would later get to do some gathering and testing of evidence of their own in a hands-on whodunnit mock crime scene activity. The café was very interactive and the presenters were able to answer questions the students had about working at a GBI crime scene. They also were informative about what classes to take in college and what to major in if they wanted to become a forensic scientist. The coolest thing about this café was that there were a few students that wanted to become a forensic scientists and they were able to get the contact information of the speakers. Those kids left with positive adult role models that will serve as mentors to help them become forensic scientists. What’s a better way to celebrate Christmas than to use forensics to find out who stole the Christmas presents? The hands on activity was a mock crime scene that was based on the movie Friday After Next. In the film, a man dressed as Santa was stealing the Christmas presents in the neighborhood. In the mock crime scene, the students were given clothing from 4 suspects. The students took DNA samples from the articles of clothing, analyzed the DNA samples and used DNA analysis to determine which of the subjects was guilty of posing as Santa Clause and stealing the presents. 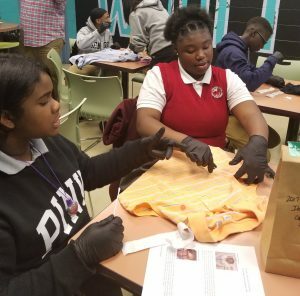 In this activity the students were able to learn and apply the basic techniques of DNA analysis from collecting the sample and reading the lab reports from the DNA analysis to determine innocence or guilt of a subject.